Esther Williams in Thrill of a Romance (1945). Swim legend Esther Williams made her appearance in a string of lavish Technicolor musicals at M-G-M. Williams simply had something no one else could do — she could carry a picture underwater! Born into a somewhat cahotic family situation, Esther was the fifth child, whose parents were originally from Kansas. Her brother Stanton showed promise as an actor, so the family moved to Ingelwood, where Esther was born. It was sister Maurine who accompanied Esther to the beach and to local swimming pools, where Esther learned swimming strokes normally reserved for men from the pool lifeguards. A very strong swimmer, Esther broke records in relay at the Los Angeles Athletic Club. At age 16, she had won three championships in the breaststroke and freestyle. Williams was also popular in high school, where she served as class president. Desiring to be a phys ed teacher, Williams worked odd jobs at I. Magnin clothing store and at modelling in order to pay for college. She was asked to replace Eleanor Holm in Billy Rose's Aquacade, where she performed with Johnny Weismuller. Williams stayed with the show until 1940. Olympic Gold hopes were dashed when the 1940 Olympics were cancelled. M-G-M, looking to compete with skating star Sonja Henie at Fox, signed Williams to a contract in 1941. Giving the young woman acting lessons, the studio asked her to swim in the pool at the Berverly Hills Hotel every day. She made quite an impression. She also toured military hospitals, doing mock scenes with recovering servicemen. Finally, Williams made her screen debut in Andy Hardy's Double Life (which played the Chinese in March, 1943), with Mickey Rooney (where a swimsuited Esther was splashed across the posters). She played a USO hostess in A Guy Named Joe (played the Chinese in March, 1944), which became a huge hit, with Esther making a strong impression. Williams was also a major hottie as a wartime pin-up. The hunch paid off. Esther Williams was a star. She was teamed with Red Skelton in Bathing Beauty (which was playing at the Chinese in July, 1944), when Williams was invited to make her imprints in the Forecourt. Since this was the age of wall-to-wall movie publicity, and since Williams was such a popular pin-up, a "G.I. Joe" was selected to appear with Williams. Apparently drawn at random, Army Pvt. Joe Brain was thrilled to be chosen for this task. Almost nothing else is known about this "G.I. Joe." Williams did a number in Ziegfeld Follies (released in August, 1945), where she performed a water ballet, then did her first big starring musical, Thrill of a Romance (released in May, 1945), with Van Johnson, but M-G-M wanted to try Williams in straight dramas, resulting in The Hoodlum Saint (released in April, 1946), with William Powell, and the comedy Easy to Wed (released in July, 1946), with Van Johnson. Next was the problem plagued Fiesta (released in June,1947), with newcomer Ricardo Montalbán, which, despite the difficulties of shooting the film in Mexico, was a modest hit. Williams began endorsing swimwear by the Cole of California brand, and became involved with the design of her swimsuits worn in her films. Many of the Esther Williams films were considerable hits, including, This Time for Keeps (released in October,1947), with Johnnie Johnson, Take Me Out to the Ball Game (released in April, 1949), with Frank Sinatra, Neptune's Daughter (released in June, 1949), with Red Skelton, where she introduced the song "Baby, It's Cold Outside" with Ricardo Montalbán, Duchess of Idaho (released in July, 1950), Pagan Love Song (released in December ,1950), and Jupiter's Darling (released in February, 1955). The film Million Dollar Mermaid (released in December, 1952), the biopic of Australian swim star Annette Kellermann, has become her defining role. In Easy to Love (released in December, 1953), William did some fancy waterskiing, while in Dangerous When Wet (released in July, 1953), where she swims with the animated Tom and Jerry, as well as future husband Fernando Lamas. Exiting from M-G-M in a huff in 1956, Williams made The Ungarded Moment (released in November, 1956), at Universal, and did some television work, including, Lux Video Theatre in 1957, The Donna Reed Show in 1960, and the Zane Grey Theater in 1961. She made her last film with husband Fernando Lamas (who directed), La fuente mágica (Magic Fountain, released in Spain in February, 1963). Williams was an astute businesswoman, involved in swimwear, swimming pools, mining operations, etc. Married to Lamas in 1969, they remained married until his death in 1982. She remarried in 1994, and died in her sleep in 2013 at the ge of 91. Cremated, her ashes were scattered into the Pacific Ocean. Grauman's Chinese Theatre, Hollywood, California. Esther Williams Forecourt ceremony, Wednesday, August 1, 1944. 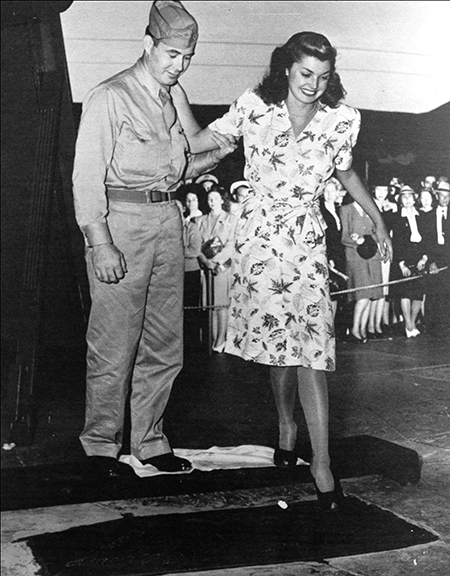 U.S. Army Private Joe Brain assists Esther Williams make her footprint in the cement.